Hockey practice plans are essential tools for any coach. They are a way of planning your practice without wondering what comes next. In addition, the players seem to respond well when a good practice plan is brought to them. Below is a rough outline you can use when design your next hockey practice plan. The reason for this part of the hockey practice plan is to warm up and gain skating agility skills. The key elements are skating, edge control, over speed and crossovers. Two large oval circles, created between the goal lines, skating through the middle of the ice. 1. From blue line to blue line increase the speed 2. Backwards between the blue lines3. 360 degree spins at the blue lines 4. Quick crossover, both left and right strides in neutral zones. Variation: Stick handle through obstacles through the middle. Drop to knees at lines. Goalies: can skate with all players. The objective of this one is acceleration. They key elements are crossunders, keep feet moving, backward pivot turn and backward forward step out. Form 3 lines at the goal line. Players start skating forward and skate to the red line, they pivot backwards and skate towards the blue line using crossunders-step out forward at the blue line and accelerate using crossunders to the far blue line. Variation: Can start out backwards to forward and with or without pucks. Goalies: Participate in drill. The objective of this one is a warm up fundamental drill. Players on all four blue lines at the boards, Pucks in the center circle. Opposite diagonal lines go at the same time, player skates to far blue line makes a tight turn back to near blue line, tight turn through center circle, pick up a puck and go in for a shot on goal. Variation: Can go forward to far blue line and backward to near blue line. Goalies: Warm up shots from mid angle. The main objectives are to change directions and control puck. Key elements are edge control, separate hands from feet, shoot off a move and goalie warm up. Players at diagonally opposite blue lines with pucks in each line. X1 leaves and skates backward toward in zone face off dot, at dot he receives a pass from x2 and turns to skate fwd to blue line, at blue pivot and skate backward across blue until you get past the far post, turn into the n zone and cut down middle for warm up shot on the goalie. Goalies: follow skater thru drill, good warm up drill. The objective of this drill is simple, stick handling. The key elements here are head up, level, and control of the puck. Divide players up into five circles, each circle has a function. 1. Big circle will have reg. puck handling. 2. One circle will be backwards. 3. One circle will be with toe of stick. 5. One circle will be dropping to one knee. This practice plan is a good start for new coaches. 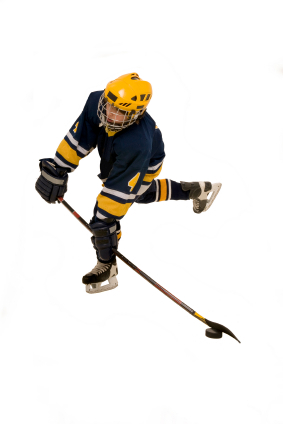 If you would like more detailed, minute by minute hockey practice plans, click here.